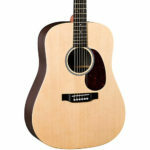 The Martin DX1RAE holds the number 2 spot on our top martin acoustic guitars list. I think that it will stay in that spot for a long time because it has almost everything you would ask for in an acoustic guitar. 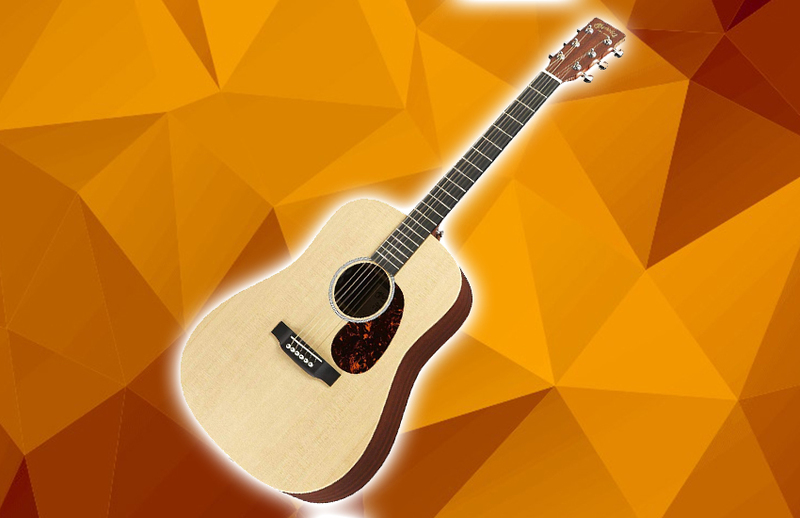 The DX1RAE is a dreadnought guitar, which means that it has great sound and it’s pretty loud. When compared to some other models in Martin’s line-up, this guitar is a bit more affordable. That is because they used cost-cutting materials for the top & the sides. When I first heard that they didn’t use premium wood on the guitar, I thought I was going to review a guitar that is over-priced and not worth the money. Thankfully, I was wrong. The top of the DX1RAE is made of Solid Sitka Spruce. This is one of the most important parts of a guitar, and it means that the guitar is durable and it allows the guitar to have a wide tonal range. I was a bit worried when I heard that the Back & The sides of this guitar are made of HPL (high-pressure laminate) Indian rosewood, but when I started to play the guitar, I saw that it didn’t affect the tone in a bad way as much as I expected. I’ve played some cheaper guitars that had the same materials, and they sounded nowhere close to the DX1RAE. The neck of this guitar is made from Stratabond. If you’re new to acoustic guitars, you’ve probably never heard of that material. What I like the most about it is that it feels lighter and stronger when compared to Mahogany, and I guess that’s why Martin decided to go with Stratabond instead of Mahogany for the neck. This guitar has a TUSQ saddle and a Corian nut. The debate between TUSQ and bone has been going on for a while now. Some people prefer TUSQ because it’s cheaper, and some prefer bone because it’s the real deal. Honestly, I can’t see the difference between them, so i have no problem with the TUSQ saddle and you too shouldn’t worry about it too much. When it comes to the playability, I can confidently say that this guitar is very easy and a lot of fun to play. The strings felt nice on the fingers, and sliding up and down the fretboard went very smoothly. Earlier I mentioned that this guitar has a Stratabond neck, and that plays a big role in the playability of this guitar. Holding the neck of this guitar is very easy and it has a shape that would be comfortable for players that have large and small hands. Overall, I think that the DX1RAE would be suitable for all guitar players. No matter if you’re a beginner, intermediate or professional player, you will always be able to find something to love about this guitar. It’s a great option for people that like to play rock, blues & country music. I played a variety of music genres while I was testing it, and I found that it performed the best when playing these genres. If you prefer a brighter tone, i would recommend you take a look at some mid-range Taylor guitars, but if you like warmer & less bright tones, you can’t go wrong with the Martin DX1RAE.